Food allergies in dogs and cats seem to occur increasingly often. However, the definitive diagnosis can sometimes be difficult to make and animals are regularly over diagnosed as a result. Scientific research has shown that for every one hundred cases of skin problems in dogs, only one is based on a food allergy. Food hypersensitivity, allergy or intolerance? These concepts are often mixed up. However, they do mean different things. A food hypersensitivity is an umbrella term for an abnormal reaction to components in the food. This includes both food allergies and food intolerance. We refer to a food allergy when the dog or cat's reaction to the food is actually accompanied by allergic symptoms. The immune system is involved in this. In all other cases, it is referred to as a food intolerance. The latter includes lactose intolerance due to a lactose enzyme deficiency or as a result of food poisoning, where the toxin from the food causes the symptoms. The immune system is not involved in this. In this article, we will only discuss food allergies. The main symptoms of food allergies in animals are mild to serious non-seasonal itching and skin problems. These occur mainly around the ears, paws, groin, eyes and snout and include itching, baldness, redness and/or bumps. Sometimes the symptoms are more subtle, such as in ear infections, and in 15% of cases they include gastrointestinal symptoms. These include vomiting after eating and/or diarrhoea. An infection of the large colon (colitis) or an increased frequency of passing stools can be symptoms of a food allergy. Some dogs also lick their feet or brush their noses on the floor. In cats, food allergies manifest themselves as crusts on the skin, symmetric baldness, eosinophilic granuloma complex and/or severe itching around the neck and head. The annoying thing is that the symptoms are not specific. The itching, skin changes and licking are also symptoms of other conditions, including atopy. The skin problems caused by food allergies are often accompanied by other skin symptoms. Aside from atopy, another common problem is a yeast infection, (Malassezia pachydermatis). The age at which symptoms start is variable, as these can affect both young and older animals. In most cases, however, the symptoms start around the age of 2. Even when an animal has been given the same diet for years, allergies can still occur suddenly. Allergic reactions are usually the result of a presence of a specific protein and in exceptional cases of carbohydrates. The most common allergens (substances that an animal is allergic to) in dogs are beef, chicken, egg, maize, wheat, soy and milk. In cats, allergic reactions are usually a result of fish, beef, milk and chicken. Cats and dogs are usually allergic to between 1 and 5 different allergens. The only way to diagnose a food allergy is by giving the animal an elimination diet. Blood tests into food allergies are not reliable in cats and dogs. There are three diet types: a home-made diet, a diet based on a unique protein source or a diet containing hydrolysed proteins. A home-made diet consists of a single protein source that the animal has not had before and a single carbohydrate source. Rice or potatoes are usually the new source of carbohydrates and the animal protein source can consist of ostrich meat, venison, rabbit or horse, for example. A disadvantage of a home-made diet is that it is quite restrictive. Your pet might develop a deficiency or even an excess of certain nutrients. This may lead to problems such as a dull coat, hunger, diarrhoea, flaky skin and weight loss. To prevent nutrient deficiencies, you can add TROVET Balance VMS to your pet's diet. Other disadvantages of giving your pet a home-made diet are the fact that it is rather labour-intensive to prepare the diet and that it can sometimes be difficult to get non-standard meat. TROVET Unique protein tubs and sausages could help you with this. This food contains meat from a protein source that many animals have not eaten before. You can add a carbohydrate source such as rice or potato yourself. The second option is a commercial diet based on a unique protein source. This diet also uses a protein source that the animal has never eaten before. However, these diets are commercially produced and contain all of the required nutrients. Examples include TROVET Unique protein sausages and tubs. Another option is to give the animal a diet containing hydrolysed proteins. This means that proteins have been reduced to such small pieces that the body is unable to have an allergic reaction to them. Royal Canin Hypoallergenic Moderate Calorie and Hill’s z/d are examples of diets containing hydrolysed proteins. The hypoallergenic diet must be given for 6 to 8 weeks. Diagnosing an animal with food allergies becomes highly likely if the symptoms reduce or disappear during this period. The definitive diagnosis can only be made after "challenging" the animal. 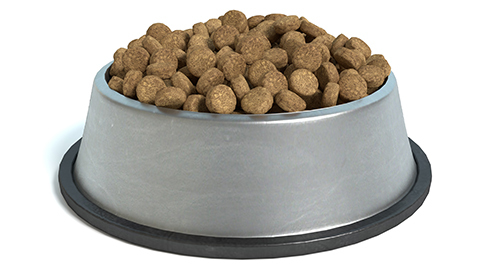 This means giving your pet the food that it was on before giving it a hypoallergenic diet. If your pet really has an allergy, the symptoms will return anywhere between 1 hour and 14 days from the consumption of the pet's original food. This is enough for a definitive diagnosis. The animal is then given hypoallergenic food for life to ensure that it remains symptom-free. During the period that your pet is given hypoallergenic food, the dog or cat cannot be given anything other than the food that is part of the hypoallergenic diet. This includes snacks, biscuits, a slice of bread or tubs to lick. The animal could have an allergic reaction to these too, and then you'll be back where you started. Also check the ingredients for any flavoured medication. Worming tablets with a beef flavour can result in a reaction. If your pet was on medication before starting on the hypoallergenic diet such as corticosteroids or antibiotics, you should wait two weeks before giving the diet in order to be able to properly assess its effect. Sometimes, your furry friend could benefit from a simple change of diet food. For example, it could be the case that your pet will benefit from switching from a well known brand such as Royal Canin dog food and Fish4Dogs. If you are unsure which decision to make then always consult your vet. For dogs with food hypersensitivity. For dogs with food hypersensitivity (horse & potato). For cats with food hypersensitivity. Supplementary, hypoallergenic mix for dogs & cats. For cats with food allergies or intolerance.